Over the last couple of weeks, anger has been bubbling on YouTube over the news that major brands pulled advertisements on the platform in an effort to avoid being matched with objectionable content. The reports, which were published by the Wall Street Journal, were met with such skepticism that they sparked scandalous conspiracy theories among YouTube’s top creators. Around the same time some content creators on YouTube reported that they saw a drop in advertising profits from recent videos. It wasn’t just racists who were hit. Even small YouTubers claimed that their revenue was “tanking faster than ever before,” though it’s hard to prove that pulled ads are directly responsible for any dips people experienced last month. There was also a short-term bug that demonetized videos en-masse. Predictably, these changes angered video creators who depend on the video platform for their livelihoods. Many felt it was unfair for the platform as a whole to suffer based on a few awful videos. Klein reached out to the GulagBear, the creator of the “Chief Keef Dancing to Alabama N*****,” the video running Coke ads that was featured in Nicas’ tweet. GulagBear reportedly told Klein that the video had not made any money since September 2016. Klein took that to mean that YouTube had demonetized the video, which would then mean it was impossible for that footage to have ads on it. Klein also asserted that, as a veteran of the platform, he believed that YouTube doesn’t monetize videos with the word “n*****” in the title, and that furthermore he found it suspicious that the viewcounts on the images shared by Nicas didn’t meaningfully change from screenshot to screenshot. “Seems like some simple fact-checks could have gone out to it before you completely demonized and destroyed a platform and the income of all their users,” Klein said. By the end of the video, Klein urges his viewers to share his investigation widely, and many people obliged. On Twitter, Klein’s announcement of the footage had accrued over 17k retweets, not counting signal boosts from other prominent YouTubers on their own pages. On Reddit, the video got over 69k upvotes just on r/videos, in addition to being reposted by 30 additional subreddits. Many top creators posted in outrage on social media, and at least a couple declared “war” on the Wall Street Journal over Klein’s investigation. Hours later, people realized that Klein’s video had a flawed premise. As it turns out, the reason the Chief Keef video didn’t display earnings after September 2016 was because a different company had claimed the video, meaning that it, and not GulagBear, would receive earnings on any ads displayed on the footage. That, in turn, meant that it was perfectly possible for the video to still display ads in 2017. Realizing his mistake, Klein made his YouTube video private so that it is no longer viewable to the general public. “I had assumed [GulagBear] would tell me if the video was claimed, and it hadn’t even occurred to me to ask him that question,” Klein said. Instead of fully backing down, however, Klein moved the goalpost by stating that he found it “extremely interesting, by the way, that in Wall Street Journal’s reporting they never mentioned that the video itself was claimed. Instead, they said that racist, hateful people were making money on YouTube, but the fact is this guy wasn’t making money, it was the person who claimed his video.” Klein allegedly reached out to the people who now own the Chief Keef video, who reportedly showed him a more accurate display of earnings on the footage. Klein ends the video by saying that he finds it strange that a video with over 159k views could have only earned about $12, so the conspiracy theory that the Wall Street Journal misrepresented something in its report is not completely dead yet. I reached out to both Klein and YouTube to ask about this incident, but did not hear back in time for publication. The Wall Street Journal stands by its March 24th report that major brand advertisements were running alongside objectionable videos on YouTube. Any claim that the related screenshots or any other reporting was in any way fabricated or doctored is outrageous and false. The screenshots related to the article — which represent only some of those that were found — were captured on March 23rd and March 24th. Claims have been made about viewer counts on the WSJ screen shots of major brand ads on objectionable YouTube material. YouTube itself says viewer counts are unreliable and variable. Claims have also been made about the revenue statements of the YouTube account that posted videos included in those screenshots. In some cases, a particular poster doesn’t necessarily earn revenue on ads running before their videos. The Journal is proud of its reporting and the high standards it brings to its journalism. We go to considerable lengths to ensure its accuracy and fairness, and that is why we are among the most trusted sources of news in the world. 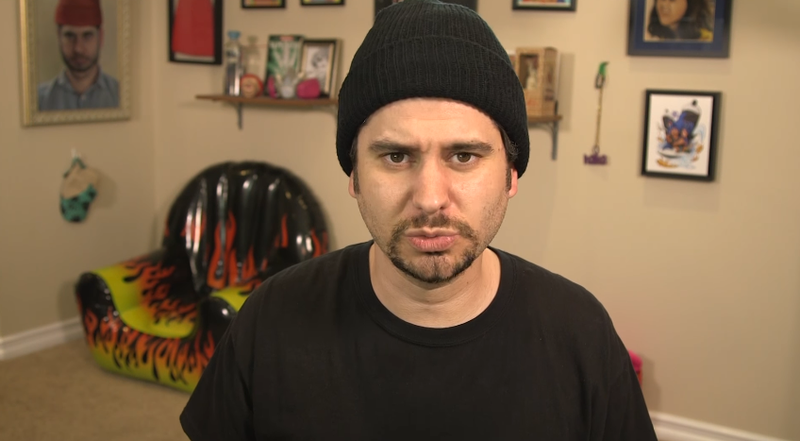 While many H3H3 fans are thanking the creator for his honesty, the conspiracy theory appears to keep spreading anyway. If you look at Jack Nicas’ Twitter mentions right now, many people are accusing him of perpetuating fake news because he supposedly doctored the images. Posts discussing the now-pulled H3H3 video also remain up on social media sites like Reddit. “Even if incorrect, the video breaks no rules and does not warrent removal,” a mod wrote on Reddit, a website which famously has communities that uphold a “no witch-hunting” rule. In the past, Klein has done some killer reporting on YouTube—he’s the reason most of us know about the shadiness surrounding Counter-Strike skin betting. For the most part, though, Klein is known as an entertainer and celebrated for his charismatic humor. That’s what has won the hearts of millions of loyal subscribers. Lately, though, he and many other YouTubers have been trafficking in the idea that old media such as the WSJ is trying to destroy new media any way it can. That’s a seductive narrative, one that presents even the biggest YouTubers as scrappy, pioneering heroes at odds with the establishment. People are so convinced that a war is being waged against YouTube, that fear, resentment, and confusion have paved the way for outlandish theories that do what so many attacking the media say the media does: putting an agenda ahead of the facts.